Having grown up in Minnetonka, Minnesota (yes, where Tonka trucks and Minnetonka Moccasins were born) and now living in Colorado, I’ve been surrounded by Native American influences all my life. I remember stumbling upon old redware pottery shards and arrowheads while camping as a kid. I never did discover any authentic wampum (a bead made by hand from the quahog or hard-shell clam), but I never stopped looking. That’s why you’ll find amazing Native American beadwork patterns inspired by Native American culture and more in this eBook! In this free eBook you will find four free Native American beadwork projects, along with two bonus articles about the history and necessary tools for traditional beadwork designing. Start simple with the Painted Desert stringing project to explore the many combinations and uses of color in stranded designs. Explore the structure behind the peyote-stitched tube necklace for a masterpiece that only looks complicated. Then take a lesson from the experts on using a bead loom, and try your hand at two gorgeous bead loom patterns. Explore the creative possibilities for each free beadwork project and enhance your skills with step-by-step instructions for each technique. The history of American Indian beadwork and beadwork patterns is fascinating, and we’re pleased to share a brief overview with you from David Dean’s Beading in the Native American Tradition in our Native American Beadwork free eBook. The pictures of the Native American beadwork, and the background of beadwork patterns from David’s book are fabulous. Our free eBook also includes four stunning FREE projects with instructions to get you going on exploring beading with a Native American flair! Whether you want to learn Native American beading for beginners (trust us, there’s plenty here!) or are just looking for great inspiration on how to craft authentic native-inspired designs, you’ll definitely want to download this eBook. With a variety of free Native American seed bead patterns—plus patterns that utilize stones, charms and other delightful finishes—you can craft breathtaking pieces of wearable works of art with this amazing resource. Each pattern not only includes excellent Native American beadwork instructions, but also high-quality photos and visual references so you can be sure you get the perfect effect with each project, no matter if you’re a newbie or an expert. Whether you’re looking for Native American beaded earring patterns, free Native American beading patterns for bracelets or just want some serious inspiration, there’s no reason not to add this resource to your beading arsenal! David offers a compelling history lesson all about aboriginal beading. Learn how glass beads and early trading in North America coincided, and how seed beads made their debut. Then discover how first Americans used fancy beadwork patterns to help show their appreciation for warriors post World War II. Decorating celebratory clothing for veterans who returned home from the war was a huge honor. 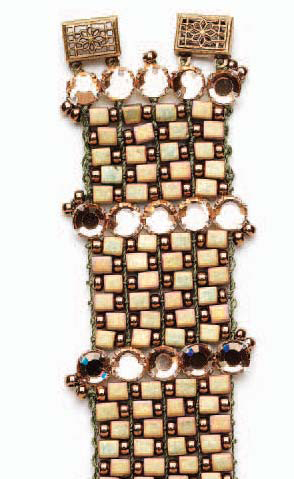 Learn more about beading history when you download this free eBook today. As with any artistic endeavor, choosing the right materials for the project is critical to its success. Fortunately for beadworkers, the tools and materials used, other than beads, are not many and may already be in your craft stash. From beading looms, to specific lighting, David covers all of the essential tools and materials needed to succeed with North American bead designs. Native Americans created their awls using buffalo shoulder or leg bone, but the materials available today make creating your own awl a cinch. Also learn about thread, cutting tools, pliers, needle cases, and much, much more. The excitement of doing a peyote stitch project is twofold. First, there is a wonderful variety of colors from which to choose. Second, the potential for unique patterns is unlimited because the more you work with color and design, the more possibilities you will find. 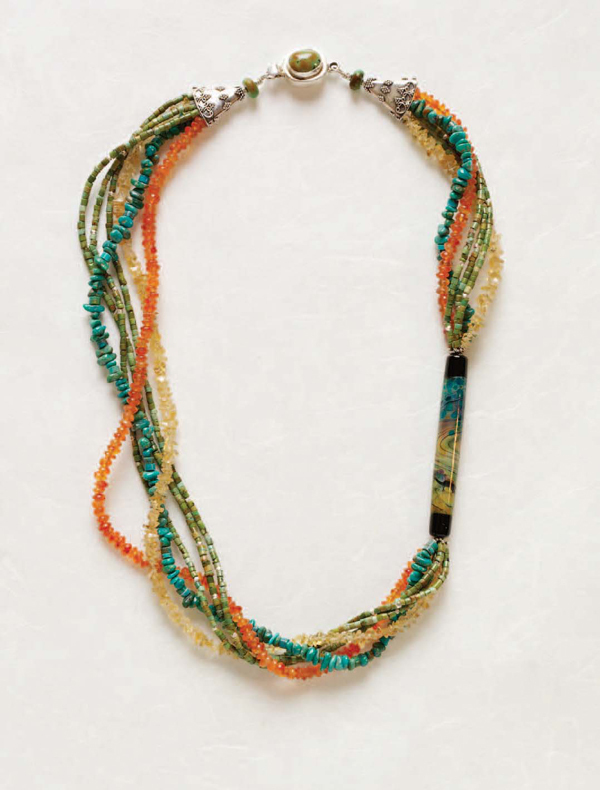 In this particular beading pattern, Donna uses red, yellow, and blue, adding light and dark orange to achieve a more gradual change from yellow to red. The contrasting colors make this beadwork pattern eye-catching and the shape makes the finished piece especially unique. It is easier than you think to create your very own loom beadwork. Follow Stacey Neilson’s step-by-step directions to learn how to use your bead loom to your full advantage. Learn how to create this gorgeous bead loom pattern bracelet, using rhinestones with a channeled metal backing for easy thread work. Take advantage of this design feature by prestringing the rhinestones on a bead loom and then weave a cobblestone texture between them. Lisa was deeply inspired by the colors of the Southwest: turquoise, burnt orange, sienna, and tan. 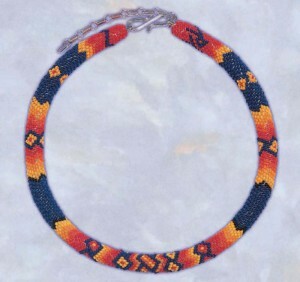 The interplay of color and various shaped beads adds textural interest in this Native American beadwork pattern. This is the perfect quick and easy project for beaders all skill levels. 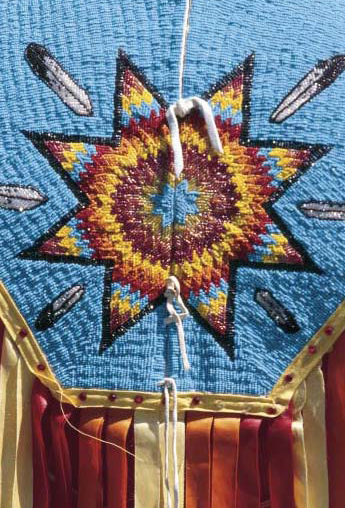 The Ojibwe Pendant is a very old loom beadwork technique. It was invented by the Ojibwe people of North America. It is woven in a continuous strip, around triangles of unbeaded warp threads. The warp threads are pulled, bringing the sections together. It is a time-consuming project but the end result is well worth the effort. 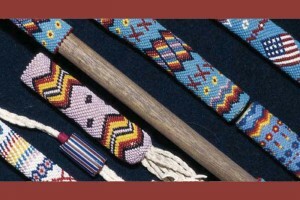 As with any beading project, the bead weaver must first determine the size (bead-width) and bead colors. Try Mary’s beautiful pattern or use these techniques to design your very own loom beadwork. This bead loom pattern will teach you beading loom techniques to expand and refine your skills. Seed beads, as we know them today, were traded as early as 1770 and a pound of beads was worth a finished buffalo robe or a good horse. Imagine that next time you’re standing in an aisle of seed beads at a bead show! We bead worshippers feel the love for our beads as we create out beautiful masterpieces, but it’s nice to know folks have felt they were as special in the past as they are to us today. Enjoy our FREE American Indian beadwork projects. 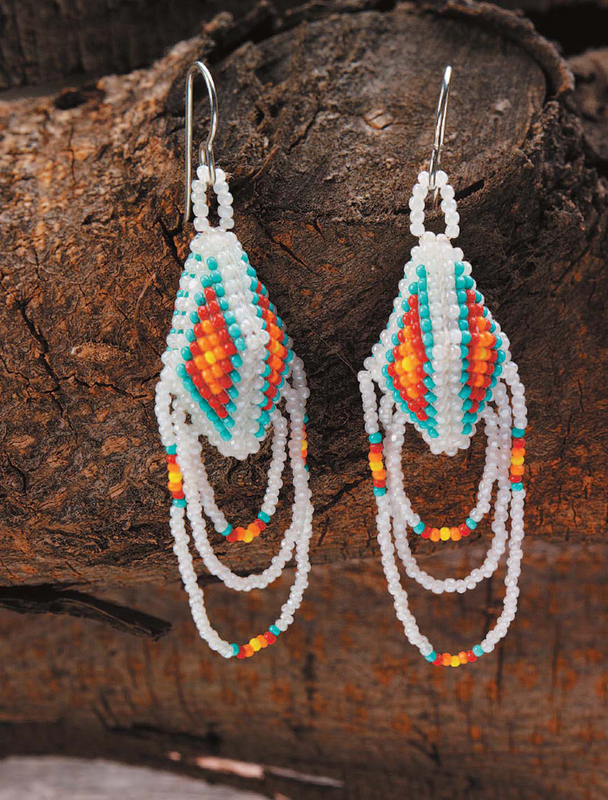 Be inspired by Native American beadwork, and pay homage to the many North American cultures and nations. P.S. Don’t hesitate to forward this email to your bead-loving friends. Anyone who has been aching to create their own American Indian beadwork jewelry designs will be thrilled with this FREE eBook! 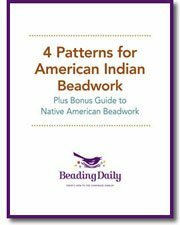 Download your 4 free American Indian beadwork projects and free bonus guide to get started today! Beaded Beads – Celebrate the Versatility!